On January 25, 2015, a descendant of the Piper family, Richard contacted me. He has been doing researching his family history for more than a decade. Though James E. Piper reported in the Southern Claims Commission records that he lost everything he had, Richard said that James owned a lot of real estate up till the time of his death. James continued to operate his brickyard business beyond the Civil War, and expended the business to Leesburg and Loudon Counties in Virginia. Also Richard provided the information on James’ death. 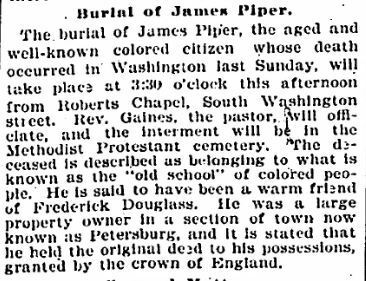 James E. Piper died in Washington, DC on December 17, 1898, while visiting his daughter, Ann Cornelia Piper Gray. Unfortunately, I do not have any pictures of James E. Piper, but I am glad to know that his descendant is planning on writing the Piper’s family history. This entry was posted in Black People of Alexandria and tagged Civil War, Piper, Southern Claims Commission. Bookmark the permalink.